One of my latest loves is working with fabric. And no, not just any fabric. It has to have had a previous life as something else like a shirt, skirt or table cloth. After getting the book 'Sweater Surgery' I fell in love with making my own felt and embarked on a new project. The book has lots of small things you can make like hats and tote bags. But leave it to me to take it to the next level and attempt to recover an entire couch! Well, it's not done yet, but when it's in a more complete stage, I'll share photo's and how-to tips. I promise! In the meantime I'd like to share some of my favorite fabric remixes off of Etsy. Another artist I'd like to share with you is Woolie Originals. I bought a halter dress and skirt from WO at the Renegade Craft Fair a few weeks and I love them! If you've done any fabric remixing of your own, I'd love to see it! Thanks so much for featuring our Sidney handbag in this fab collection! So many talented fabric remixers! 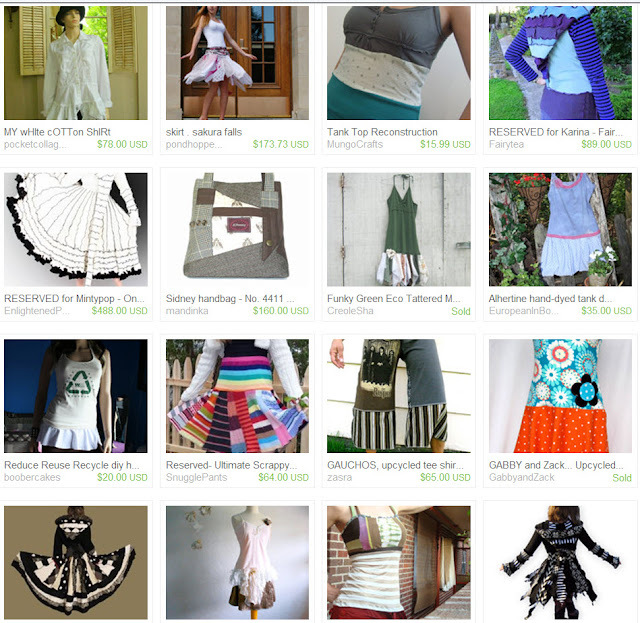 I so appreciate you mentioning my upcycled cami tank dress. Thanks a bunch.